The IU Lilly Family School of Philanthropy's "Philanthropists in Training" Jagathon Dance Marathon team will be lending a helping hand to Riley Hospital's Palliative Care program. Graduate and undergraduate students from the school have teamed up to create an art auction fundraiser to benefit the program. 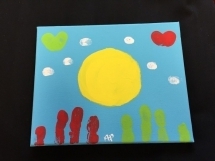 Called the Helping Hands Art Auction, the students have asked leaders in the Indianapolis community, IUPUI and the Lilly Family School of Philanthropy to lend a helping hand to Riley by personally creating finger paintings that will be auctioned off online, with all proceeds benefiting the Palliative Care program. The Helping Hands Art Auction will begin Monday, February 16 at 9 a.m. ET, and bidding will conclude on Sunday, February 22 at 9 p.m. ET. Auction items can be viewed here. Word of the auction can be spread on social media using the hashtag #JagArt4Riley. The Philanthropists in Training Team is participating in the IUPUI Campus-Wide Jagathon, a 12-hour dance marathon benefiting the Palliative Care program at Riley Hospital for Children. Since 2003, Jagathon has raised more than $172,000; this year’s overall goal is to raise $100,000. Palliative Care at Riley Hospital for Children is a support program for children and their families as they face the challenges of a life-limiting diagnosis. It includes services that helps patients live without limits, from advanced symptom care to hospice and bereavement counseling and is delivered by a collaborative team of physicians, advanced practice providers, nurses, social workers and spiritual care providers.